These were part of a series of MAD magazine submissions that I worked on with writer Roger Brown that included including uses for your frog like a Star Wars Light saber and Robin Hood’s Bow. Unfortunately, they were not accepted but I always really liked them. 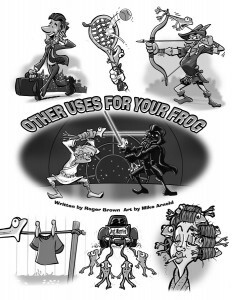 I feel they could have made a funny gag cartoon book with one per page maybe along the lines of a “101 Other Uses For Your Frog” or something like that. This entry was posted in Gag Cartoons & Comic Strips and tagged cartoon frogs, Darth Vader, gag cartoon, Robin Hood, Star Wars cartoon. Bookmark the permalink.